GJ.16, 4R. yellow-green, worn impression, with "plate flaws at top" variety, mint no gum, one margin touching. Catalog value US$200. 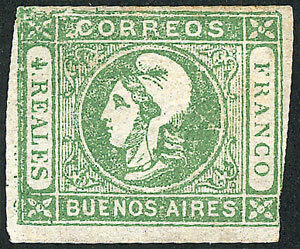 Lot 21 - Argentina corrientes - Guillermo Jalil - Philatino Auction # 1916 ARGENTINA: "Budget" auction with many good lots at VERY LOW STARTS!